He was born in 1975 in Bratislava. In the early age he has got interested in computers and started his self-education process. In the year 2000 he achieved his Master's degree in Computer Science at Slovak Technical University in Bratislava. Meanwhile during his studies he has started to develop his programming skills in realtime generated computer imaginery and the exploration process of his visual language provided by his `code' and new personal interest in graphics design, experimental web design (or net.art), photography with the focus on computer post-production. Since 1995 he has started to support the demo-scene community by his works and spreading them to other fields of computer art through internet on his web-sites for free. Couple of net-art/webedelics projects has been established providing the space for other creative people as well. He got part of No-Such (ex. Hell.com) group of net.artists and took part in their live cooperative performances. At this time he is interested in creation of visual flow in live enviroment as well. At the end of the year 2001 he started the development of Circulation software. By this tool he can create his live-video performances with emphasize on live aspect and full control over the producing image without the loss of the quality. Circulation software became kind of visual synthethiser and it is designed as a video-mixing software and real-time post-production facility. Zden started to use this software in motion-video productions, and play his live `set' on diverse events: including self-organized "underground" occasions, clubbing parties or music festivals. 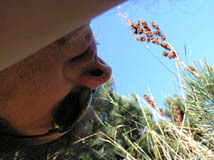 Zden also cooperates with various musicians, acedamic artists, dancers, experimental computer artists. He gave out couple of presentations and speeches about his development and the way of working with and by the media. He labels his works or participations with alias `Zden' and usually underlines his connection with Satori production company (label). * the portfolio of realised commercial software projects available on official contact. * Circulation is briefly software-based real-time 3 source video mixing engine. The source of mix can be input from live cameras, video-files stored on computer hard-drive, pictures or generative programmed graphics. The set of 50 post-effects is ready to post-produce the mixing sources. 18 mixing modes and 8 mixer post-effects. All optimised for performance (MMX/MMX2) and controlled via set of midi-controllers (midi), keyboard/mouse inputs, network control or scripted control is possible as well. Jeff Mills, Christian Vogel, Metalheads DJs, Asian Dub Foundation, Fleischman, Bauer & Rehberg, Koji Asamo, Pomasl, Wipe out, Waxsolutionists, Supercity Sound System, Tibor/Dalo/Toky, Lackluster, Hiaz, Puppetmastaz, Funkstorung, Safety Scissors, Abuse, I-Wolf, Veneer, Laika, Sportfreund Stiller(lol@tour), Mouse on Mars, Peti & Tigris, John B, Klute, MC Tali, Roni Size, Dj Zinc + MC Stirlin, Luke Vibert, DJ Vadim & band, and ... ..
* this generative works are entirely done with programming skills (own softwares) running in real-time! Feb 2004, Fuckhead (http://satori.sk/fuckhead.html) to be released on Fuckhead's DVD soon! Demo’ers demo’ing, custom sound synthesizers playing numbers vs computers drafting numbers. http://vj.zden.sk - vj recordings / branded live!